'SEEMAS-HD' foundation course is developed on thorough Research and piloting in various schools and systems in India. Even though the children are with enough IQ levels, they face problem in understanding concept as well to apply the learned things in day to day life. At higher levels the student fails to understand the things due to lack of prerequisites (Basics). This problem makes the child unable to learn as well to apply learned concept. SEEMAS-HD came out with a solution by designing tool/method which can help teacher and student for better learning. 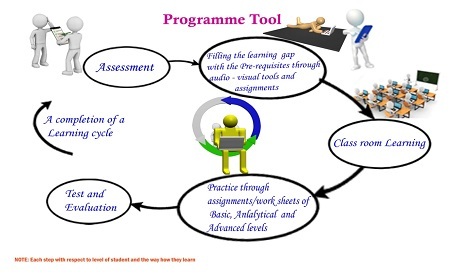 Making child as a self learner by diagnosing and filling their learning gaps, through which the student can learn basic level to advanced or application level with this tool. They can easily assessed and fill their learning gaps them self. This makes the child confident to learn present concept easily. Practice makes them to apply the learned concepts, so that they can face any competitive exams. Student habitated to a methodology due to which student turns as a self learner. Self learning ability makes them to learn anything in their life.